I'm hoping for some thoughts, comfort, and clarity on my little mouse's death. About 4 weeks ago, I saved three feeder mice from being my brother's snake's food. Fast forward 3 and a half weeks... I went to clean their cage, and noticed one of the mice was very unwell: tiny, lost weight, hunched posture, shaking, barely moving, scratching her ears a lot, one eye looked strange (kinda dull and not so bright), heavy breathing. I quickly isolated her from the others and spent the night and next day with her. I tried to get her to eat and drink, and she did a little. All she wanted to do was climb into the palm of my hand and lay there for comfort. Ugh my heart. That evening I tried to get her to drink some more water and then she began to look at though she was gagging or gasping for air, twitching, struggling to breathe, and then she dropped dead right before my eyes, just like that. It's been 4 days since, and I can't forgive myself! I've been crying ever since and asking myself over and over, what did she die from? URI? Malnutrition? Did I ultimately choke her when trying to get her to drink right before she began struggling to breathe? Was I not gentle enough when handling her, did I hurt her? Why did only she get sick and not the others? I'm blaming myself for not paying more attention to them, cleaning them more often, or providing better food, etc. It breaks my heart that there are so many kinds of foods out there marketed for mice that are filled with these "fillers" and people like me fall victim to these cruelties. All I wanted was to give her a chance, and I failed her. I hadn't even named them yet, but I have now. RIP little Clover. I have frozen her so that I may bury her in a potted plant eventually, has anyone ever done this and how did they do it? All I keep thinking about is how much she must have suffered, her poor little sad face, and how she came to me for comfort and I wasn't able to help her. I keep looking at the pictures I took of her and the video I took from when I first found her ill. Why am I doing this to myself? I still have little Spot and Peanut and hope that I won't fail them. I'm really sorry for the loss of little Clover. I can tell that its hit you hard. Its really important you don't blame yourself though. Mice have such delicate immune systems that they can often get ill with no obvious reason for it. I'm sure its nothing you did wrong. I'm glad you were there to comfort her on her last day and she had someone like you around and wasn't fed to the snake. 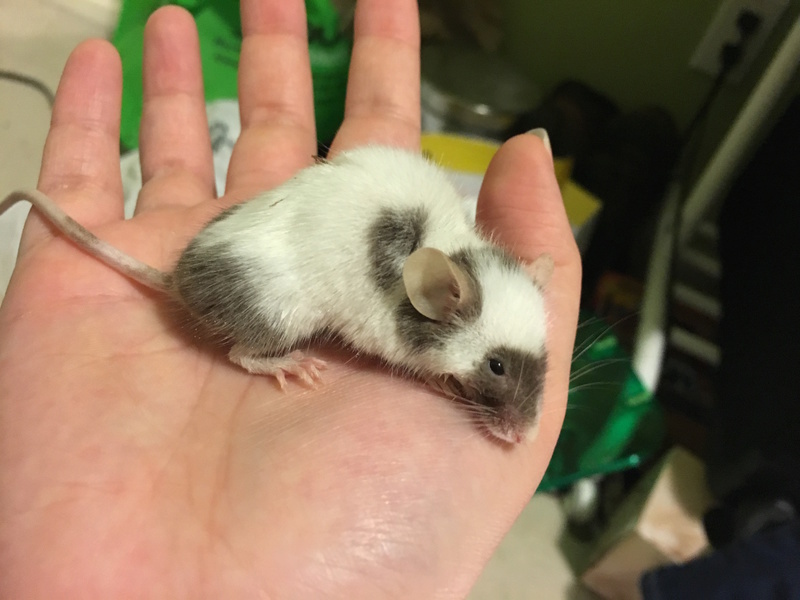 I'm not an expert in mice, so I can't help with what she passed from, but if you notice any symptoms from Spot and Peanut then do take them the vet in case Clover had something infectious. Vets can also do a necropsy to find out what she died from if you wanted to do that - its just an option. Someone here may be able to help with possibilities, but none of us are vets so we can never give a definite answer. We're here for you at this difficult time. Remember she passed over the Rainbow Bridge feeling loved and being comforted. That's what's important - you gave her a chance of happiness and she got that, however short it may have been. I'm so sorry for your loss. I think it's really easy to blame yourself when a pet dies, and I've personally found losing mice to be especially difficult because of the "it's just a mouse" mentality. When I lost the last of my first pair in August, it took me over a month to fully grieve because I loved her a lot, but I had a thought stuck in my mind that I wasn't allowed or supposed to be upset about it, even though the people around me really validated the fact that it was okay to. You're certainly not alone in feeling this way. That said, I really don't think you should blame yourself. Pet store mice, especially feeders, can have a lot of health problems. Unfortunately, animals are good at hiding when they're sick, and it can be too late to help them by the time we realize they need it. You did your best and gave her a safe, loving place to live. I know it's hard, but I hope you can think of all the amazing things you were able to offer her during her life. She was lucky to have you. I agree with the other replies and I'm so sorry for your loss. You did absolutely nothing wrong. I experienced a similar ordeal with my poor little Lucy, and I know it's hard. But you didn't fail her. It sounds like her health was so poor already when you got her that there was likely little that could've been done. It hurts, but look at it this way: instead of letting her die alone and miserable you did your best to make sure she went as comfortably as possible, and more importantly, she died being loved. Her time on this earth was not meant to be long, but you did all you could to make the last little bits of it as bright as possible. I'm sure she appreciated that. And don't let anyone tell you "it was just a mouse". It was a life that was lost. You can take all the time that you need to mourn it. It breaks my heart to read your post because we have all been there, so we certainly empathize with how you are feeling. I have asked myself those same questions and blamed myself when animals have died. You didn't do anything wrong. And were such a comfort to her before she died, she knew she didn't have much time and she wanted to be with you. It's gut wrenching for sure though. I'm so sorry for your loss. These precious little souls are so fragile, and can get sick so easily. I hope your other girls stay strong. Thank you all for the love and support. It's been a hard week since I lost Clover, but I'm slowly coming to terms with it. I didn't have her long but I miss that little face. Oh, poor little darling. That picture breaks my heart. One thing I should mention however is that you should probably get a new mouse to take Clover's place. I know that sounds awful, but female mice do best in groups of at least three and you should try to maintain at least that number. Just be sure to keep any new mice you get in a three week quarantine so that any potential illnesses that your new or old mice might have have time to manifest themselves before you put them all together. She was beautiful, I'm so sorry for your loss. We understand how much a person can love a mouse and how painful that loss can be. The relationships we have with our mice are no less meaningful than any of our other relationships. When I lose a mouse, I grieve, unapologetically. Sometimes for weeks. She was lucky to have you. Most mice live terrible lives and die without being loved or cared for. Clover was loved and she knew it. I had to post just to say that I'm grieving with you right now, having lost my little girl, Crunchie, 2 weeks ago. So just know, that you are not alone. Although, I know from experience that knowing you're not alone doesn't really help you feel better. Your loss is your own, so take your time and deal with your loss however you need to. Please do try to take comfort in knowing that sometimes there just isn't anything we can do for them, except love them. It sounds to me that is exactly what you did. If nothing else, you saved these little guys from a much more terrifying life and death, being treated as food, and you gave them the love they deserve. I believe that no creature should have to leave this world alone and without having been loved, and Clover didn't. You did everything you could for little Clover. Don't think of it as you failed... instead remember that you truly saved her life! That is a very precious gift that you gave her, and nothing can take away from that. @FurMommy wrote: I had to post just to say that I'm grieving with you right now, having lost my little girl, Crunchie, 2 weeks ago. So just know, that you are not alone. Although, I know from experience that knowing you're not alone doesn't really help you feel better. Your loss is your own, so take your time and deal with your loss however you need to. Please do try to take comfort in knowing that sometimes there just isn't anything we can do for them, except love them. It sounds to me that is exactly what you did. If nothing else, you saved these little guys from a much more terrifying life and death, being treated as food, and you gave them the love they deserve. I believe that no creature should have to leave this world alone and without having been loved, and Clover didn't. You did everything you could for little Clover. Don't think of it as you failed... instead remember that you truly saved her life! That is a very precious gift that you gave her, and nothing can take away from that. I'm so sorry for the loss of Crunchie. It gets better with time, though we'll always mourn their loss. They are just so helpless and fragile the poor little souls! Spot and Peanut are still going strong, they are happy little girls.